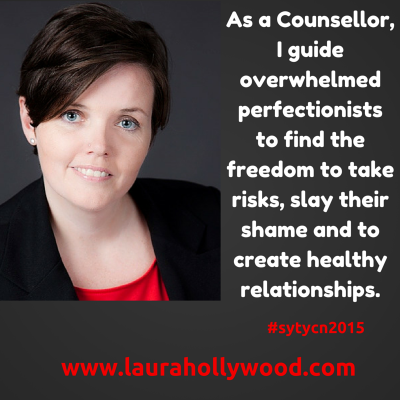 As a Counsellor, I guide overwhelmed perfectionists to find the freedom to take risks, slay their shame and to create healthy relationships. 5. Right now this is a solid 5/10 for me. The questions that arise for me here are: do they already know their perfectionists? Do they know this is the source of their overwhelm and what’s curtailing their sense of freedom and ability to take risks and rooted in shame? The result you’re offering to “create healthy relationships” is clear and it tells me that current relationships are unhealthy but i’m not sure what that means exactly? And I’m not sure how it connects with them being overwhelmed. It starts out with me thinking you’ll help me with my overwhelm but then it ends with you helping me with my relationships. So I feel a little confused by it. 7/10: I recognize that you are talking about me; at the same time, I wonder if that narrows it down enough. I work hard at becoming imperfect — I’m a nascent imperfectionist — but it never occurred to me to think about relationships as targets of my mania. It might help focus your niche if you could come up with concrete aspects of their lives. Are they mothers? Business owners? Artists? Just one more descriptor would help a lot. 10/10: I love it. Speaks to who you serve. goes from pain to pleasure and tells me what to expect from working with you too. love the pic stark contrast color tones too! Great work! Good Luck! I give it a 10. I think Tad is onto something – as a person with high standards, I don’t know that I would call myself a perfectionist, I just like to get it right. So if you’re targeting people who know they’re doing the perfection thing and how it interferes with their lives, then you’re an 8 (all perfectionists don’t feel shame or apply it across the board). If you want perfectionists to find you and discover the impact, then maybe not so clear for them 5? These little snippets of what we do are hard to convey, eh?